14 cu. ft. DUMP CART with a capacity of 700lb/14 cu. ft. Release pedal and removable tailgate for easy loading and unloading. Easy for tipping, just touch the foot pedal and lift the side rail, tip over the cart bed. Comes with 16 inch pneumatic tire and suitable for any lawn tractor. Commercial Pro Truck Spreader Swisher's Commercial Pro UTV-Truck Spreader spreads grass seed, fertilizer, salt or sand with even consistency. Adjustable spread widths from 4' to 16' in diameter depending on material. Heavy duty permanent magnet DC motor; motor wiring included; Features an 8" easy-fill spin-on cap with breather vents tank for consistent flow of product. The universal fit mounts easily to your existing 2" x 2" receiver and includes a new height adjustment feature for use on vehicles with lower hitch heights; Easy installation, all hardware included. 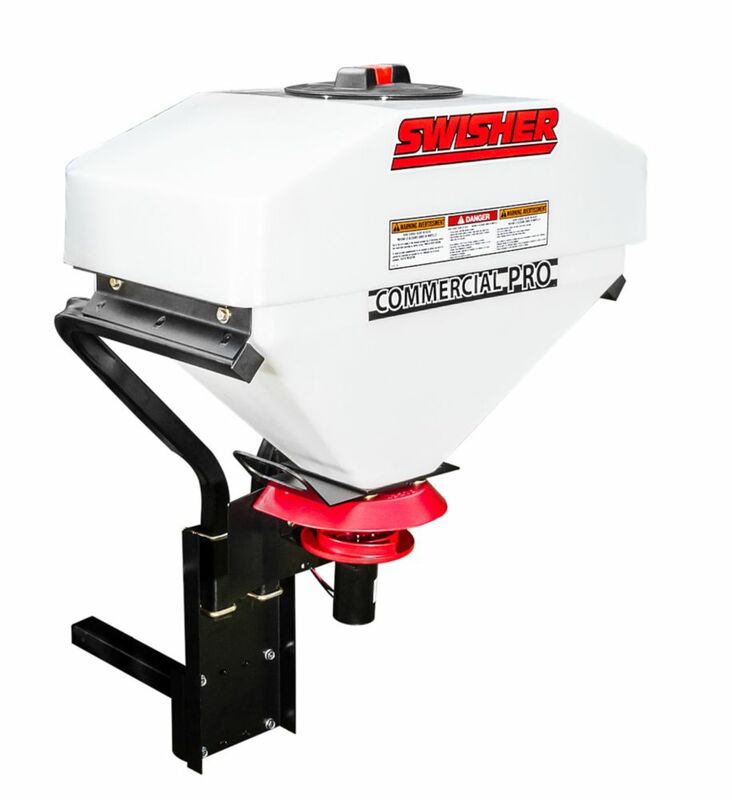 The opaque poly tank 25-gallon hopper allows for easy visual of contents; 300-lb. capacity. Commercial Pro Truck Spreader is rated 2.8 out of 5 by 16. Rated 4 out of 5 by Jean from It does the job we expected. Directions were a little... It does the job we expected. Directions were a little hard as there was not a real good description of the hardware, but overall it does what we wanted. Rated 2 out of 5 by Unhappy from This product is described as able to spread sand. This will not spread sand as it clumps in the b... This product is described as able to spread sand. This will not spread sand as it clumps in the bottom due to the small hole and no auger. This would only be useful for salt and seed. Rated 1 out of 5 by gunruner from Total waste of my time putting this piece of junk... Total waste of my time putting this piece of junk together.Didn't drop salt for more than a few seconds, had to keep shaking the hopper, was using dry #1 rock salt. Finally tied a rope to it so I could keep shaking it from the cab while driving. the spread pattern when full open was about the width of the truck. 250 pounds of salt to get a 3 or 4 foot path down my driveway. Packed it up & returned. Garbage. Rated 3 out of 5 by JimF from The materials are OK, about what I expected. It is a little tricky to assemble by yourself, espe... The materials are OK, about what I expected. It is a little tricky to assemble by yourself, especially the springs and spacers on the spinner. It works good with a medium coarse salt. Since there is no internal agitator, fine salt, or mixed salt with fines in it tends to bridge and stop flowing, and of course, chunks in the salt stop it completely. With the right salt it spreads well and is easily adjustable to a consistent driveway width. It could use a roll switch on the power cord. Rated 2 out of 5 by James from You get what you pay for item is functional and will spread salt granules large with ease but any kind of a sand mixture will clump and not disburse has no vibration in the bucket so Sand pools on the sides and condensation makes plastic wet and damp soaking into the sand not very functional for Northern weather.. Rated 5 out of 5 by Norm from had 2 special springs missing and one special size bolt, had to go the hardware store. the power... had 2 special springs missing and one special size bolt, had to go the hardware store. the power cord was to short had to add 8ft. of electrical wire. to make it work.